Download and complete our fillable PDF entry form. A group of people usually runs individually, or breaks into small teams. Teams consist of two or more people running together. Teams of two usually work well. We recommend a maximum of three people on a team. A team completes one entry form for the team and uses a single electronic punch (“finger stick”) to record controls. We strongly recommend that each team member has their own map, so they can learn orienteering too. Groups such as JROTC often run individually, while scout groups should run as teams. A family might compete individually, or as one or more teams. Download our fillable PDF entry form and save it on your computer so you can fill it out in advance. Note: Depending on your browser, you may have to right click the link and then select something like “Save Link As …”. Open the file you just saved with Adobe Acrobat Reader or a PDF editor that can handle fillable PDF forms. Fill in the form with Adobe Acrobat or another PDF program. The file contains two entry forms side-by-side. You need one entry for each person or team that goes out together. We discourage having more than 3 people in a team. Each person on the team must have a whistle, and we highly recommend a map for each person (otherwise they are just along for the walk, and won’t learn much orienteering). Each team has a single electronic punch or “finger stick”. Check the course level that you want to run (or circle if writing the form by hand). See Course Levels if unsure. Enter the phone numbers and address of the team or group leader. Cell phone should be a number where we can try and reach you at the park if you do not return on time. Fill in your vehicle information. If we can’t contact you by cell phone and this vehicle is no longer in the parking lot we assume you have gone home without telling us. Please don’t do that! and save it to your computer. 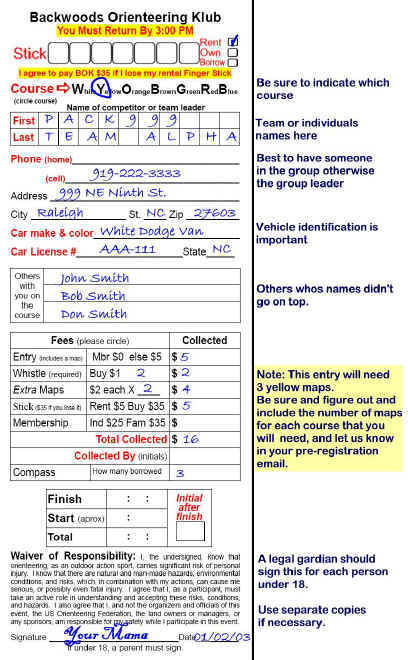 This form is a simple spreadsheet that helps us plan appropriately for your group by having enough maps for each course, and helps you total up what you need. Enter the contact information for the group leader. Please include a cell phone number where you may be reached during the event. The summary section shows the items you need and the total cost for your group. After you send us the list, we will send you the list back with the finger stick assignments that you can put on your entry forms. (If you don’t get the stick assignments back don’t worry about it, we’ll give them to you at the event. Print your entry forms (with or without the finger stick numbers) and divide the pages into individual entry forms. Bring these with you to the event. Plan for a map for each person. We strongly recommend that each person have his/her own map. It is impossible to learn orienteering if someone else is holding the map. The two main skills you want to develop in orienteering are holding your thumb on your location with the map oriented correctly, and noticing the features on your map and in the terrain while you are walking in the forest. Therefore you need the map in your hand so you can adjust it when you turn a corner or pass a feature. Each of those changes in direction or seeing a feature is a teaching moment. If you are sharing a map the continuity is lost, too much time is spent stopping and showing stuff to the kids, and the kids aren’t recognizing the stuff for themselves. Extra maps are only $2 each. Please get a map for each person. Also, your kids can keep their maps as souvenirs. We hope this procedure will make group registration and results reporting go smoothly. Umstead Park does not allow buses to park inside the park! If you are planning to bring your group using a full size commercial bus or school bus you will have to park the bus outside of the park during the event. You may drop off and pick up your group inside the park, but must park the bus outside the park during the event. Please notify the event director so you can make arrangements to shuttle your driver back to the park if that will be necessary. Small buses that can fit in a single parking space are permitted.